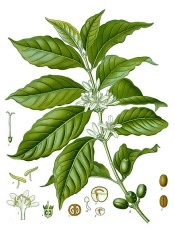 Coffee plant is the source of the world's most popular breakfast beverage. Not many know, however, that it makes a beautiful and easy-to-grow house plant. This member of the Rubiaceae family is one of 90 in the Coffea genus. Coffea arabica is believed to be the first species of coffee to be cultivated, being grown in southwest Arabia for well over 1,000 years. It is an evergreen shrub that has glossy, dark-green leaves with ruffled edges on willowy stems. Coffee bean plant can reach 15 ft or more in its native tropical habitat, but stays much smaller confined to a pot. You can cut it back to control its size. Pruning harshly won't hurt it at all. Prune coffee plant back in spring to keep it bushy and full. Pruning also gives it an attractive shape. Use clean pruning shears to cut the stem at a 45° angle, 1/4-inch above a leaf axil (the place where a leaf attaches to the stem). Prune off top growth to keep this coffee bean plant small. Repot in spring, moving to a pot 1 size larger. Use a pot with a drainage hole to avoid soggy soil. 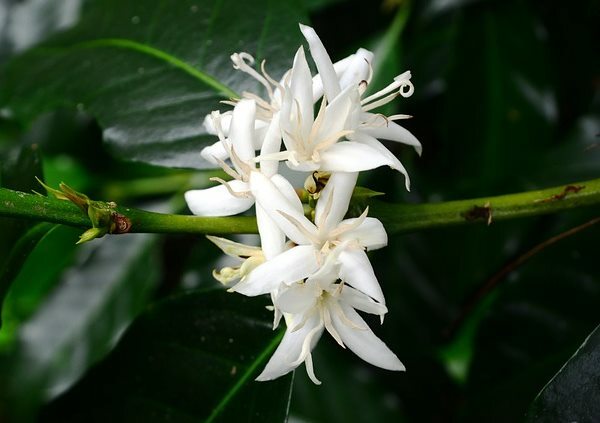 After 3 or 4 years, Coffea arabica produces star-shaped, sweetly scented white flowers. These flowers are followed by green fruits which change to red then to almost black as they ripen, a process that takes several months. 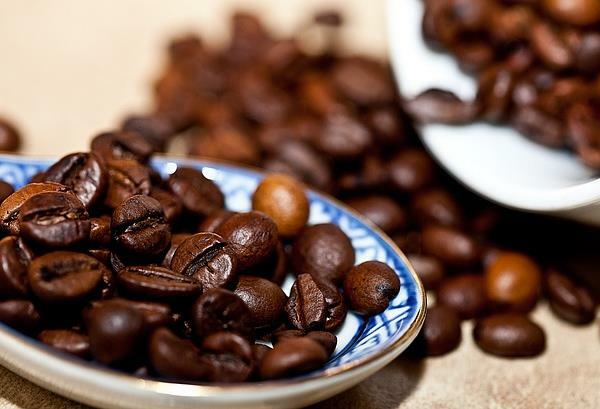 Inside each ripened fruit are 2 seeds (or beans) that when properly roasted can be ground and made into coffee. Growing coffee plants indoors is easy. They are vigorous growers and are long-lived. They make attractive house plants, just don't expect them to offer that morning cup of joe. It could take a few years before you see many fruits on it. You can buy this plant at some online nurseries. 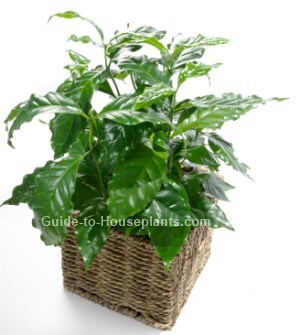 Look for the cultivar Coffea arabica 'Nana' if you want a more compact plant. 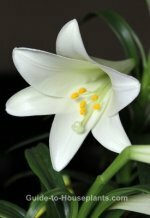 Height: To 6 ft (1.8 m) indoors, confined to a pot. You can prune your plant back harshly in spring to keep it at the desired size. Light: Keep in bright light, shaded from direct sun. Water: Keep soil thoroughly moist in spring and summer, barely moist in fall and winter. Always use tepid water for watering your houseplants. Humidity: Requires moist air. Use a cool-mist humidifier for best results. Temperature: Average room temperatures 65-75°F/18-24°C. 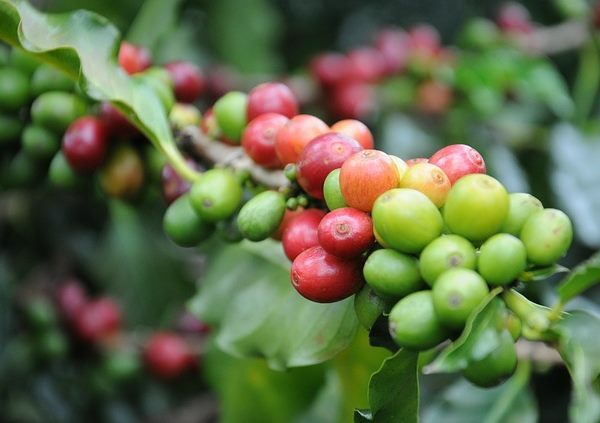 Coffea arabica can withstand cooler temperatures in fall and winter, when growth slows down, but it's not tolerant of freezing temperatures. Soil: Peat moss based potting mix with horticultural sand added to provide good drainage. Propagation: Sow fresh seeds in spring. Cuttings are difficult to propagate, but you'll have the best chance at success by taking young stems before they have hardened.